My apologies for there being no updates on the blog in a while. 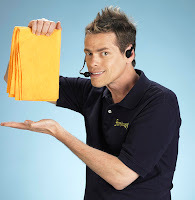 I purchased a set of ShamWow's, and have spent the past month cleaning various spills around the house in astonished amazement, unable to function in a normal capacity. Or maybe it was simply hearing that creepy ShamWow salesman's voice over and over and over. Seriously, thanks to those who sent prayers and well wishes, and others for being patient. There was a potentially serious medical issue we had to deal with, and it was a scary couple of weeks. But everything is about as good as it can be right now. The blog will have updates more regularly, though it is typically slow for the six weeks from signing day to the start of spring practice. There was some news today regarding football tickets. In the current economic crisis, UConn announced a new plan on season tickets prices for the new three-year cycle. "We've been working on it the past 12-15 months," UConn AD Jeff Hathaway said. "As we've wrapped up this process, the crunch has really been felt the last three to four months. We felt there were areas that needed to be tweaked ... to be sold out on a season ticket basis." Hathaway said the goal is 34,000 season ticket sales (it was 28,000 last fall) in hopes of selling out every home game. He also said there are no immediate plans for stadium expansion. STORRS, Conn. (February 3, 2009) – The University of Connecticut Division of Athletics has announced prices for football season tickets for a new three-year cycle, which covers the 2009-2011 seasons. Included in this ticket plan, are new pricing points for “club” and “chairback” seats at Rentschler Field. Season tickets may be purchased at the Online Ticketing Center at UConnHuskies.com or by calling the UConn Athletic Ticket Office at 1-877-AT-UCONN. UConn has sold football season tickets at Rentschler Field in the “club” and “chairback” locations in three-year cycles since the stadium first opened in 2003. The first cycle ran from 2003-2005, the second from 2006-2008 and the third starts with the 2009 season through 2011. All seats that are purchased with a three-year committment, which include club, chairback, preferred and the option on reserved, come with the same seat location for all three years. There has not been a ticket price increase at Rentschler Field since the stadium first opened; however, seat donations for various locations did increase from the first cycle to the second cycle. In the first two ticket cycles at Rentschler Field, all “chairback” seats were sold at one price with one standard annual seat donation regardless of their location. This will change in the 2009-2011 cycle. In the three-year ticket cycle that was just completed – all chairback season tickets were priced at $210 (based on six home games) and a seat donation of $650 for a total of $860 per seat. Chairback season tickets will now be offered in three pricing categories – lower, mezzanine and upper. The lower chairbacks are the chairback seats in the lower bowl of Rentschler Field. In this new three-year cycle, a lower chairback season ticket will cost $210 (based on six home games) and a seat donation of $500 for a total of $710 per seat and a savings of 17 percent from the last cycle. The mezzanine chairbacks are the chairback seats in the first 15 rows of the upper bowl at Rentschler Field. In this new three-year cycle, a mezzanine chairback season ticket will cost $210 (based on six home games) and a seat donation of $400 for a total of $610 per seat and a savings of 29 percent from the last cycle. The upper chairback seats are the chairback seats in rows 16 and above of the upper bowl at Rentschler Field. In the new three-year cycle, an upper chairback season ticket will cost $210 (based on six home games) and a seat donation of $225 for a total of $435 per seat and a savings of 49 percent from the last cycle. In addition, club seat pricing will be reduced in this cycle. In the last cycle, club seats cost $240 (based on six home games) and a seat donation of $1,400 for a total of $1,640. In this cycle, club seats will cost $360 (based on six home games) and a seat donation of $900 for a total cost of $1,260 and a savings of 23 percent from last season. There are approximately 600 club seats available for sale, 4,000 chairback seats and 13,000 preferred seats. All these plans include a seat donation. There are nearly 11,000 seats available in the stadium that do not require a donation --- Reserved, Family Plan and Young Alumni. The balance of the seats are sold to UConn students, the visiting team and are accessible seating. Pricing for the season tickets is guaranteed through April 30. Seat donations are guaranteed through life of three-year cycle. The purchase of a pair of chairback tickets includes one free blue parking pass. An additional blue pass may be purchased with the ordering of another pair of tickets. For each pair of club seats ordered, one free gold parking pass is included. Notes: For the past six seasons, chairback seats were sold as one section; ticket prices guaranteed through April 30; club and chairback seats must be purchased through a three-year commitment.